by "Petersyn" from "Saks Fifth Avenue"
ONLY AT SAKS. 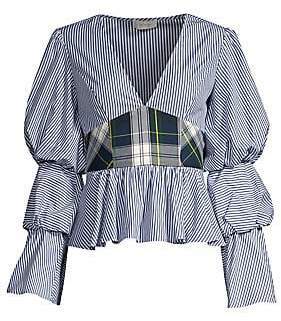 A preppy plaid bodice defines this flirty ruffle top with pinched statement sleeves. V-neck Long sleeves Side zip closure Peplum hem Gathered detail Cotton Dry clean Made in USA SIZE& FIT Flounce silhouette About 21" from shoulder to hem Model shown is 5'10 (177cm) wearing US size Small. Contemporary Sp - Trend. Petersyn. Color: Cadet Galaway. Size: Small.